1949 Massachusetts FALL INSPECTION Sticker - $20.00 : Bob Hoyts Classic Inspection Stickers, Add a Final Touch to your Restoration! 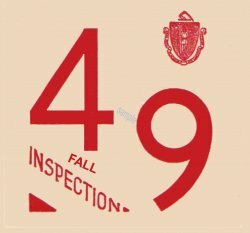 This is a 1949 Massachusetts FALL INSPECTION Sticker. They were issued from November, 1948 to April 1949 and they were good for one year.